MalwareGuard System Firewall is a tool to stop Hackers, Trojans, Spywares, Viruses, DoS attacks & data thieves & protects your PC from Internet-borne threats. Put a secure barrier between your hard drive & hackers, whether you use a dial -up, ISDN, DSL & cable connection. Includes four inter locking security services: a firewall, an Application Control, an Internet Lock, & Zones. Allows you to Lock your PC ,so no connection will be allowed. 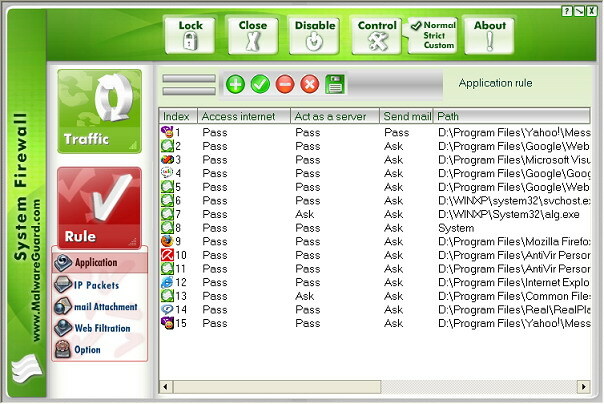 ...... You can Check and control all the IP packets passed thru the net interface , Control application network operation: visit website, act as a server and send E-mail,etc.Protect E-mail security by changing attachment extension. Filtrating malice or useless HTTP content, e.g. block Cookie, WSH script and pop-up ads. Protects form any hacker attacks and intruders . Protects your privacy and confidential data . Works in invisible (stealth) mode inaccessible for any outside intruders . Provides with information about network activity of your PC . Leads history about all network incoming and outgoing sessions.Provides personal rules policy for all applications which use network on your PC. Works with any applications you install on your PC. Easy and fast self-learning system. Qweas is providing links to System Firewall 1.0.0.1 as a courtesy, and makes no representations regarding System Firewall or any other applications or any information related thereto. Any questions, complaints or claims regarding this application System Firewall 1.0.0.1 must be directed to the appropriate software vendor. You may click the publisher link of System Firewall on the top of this page to get more details about the vendor.